April is Confederate History Month in Georgia. In keeping with the tradition of honoring our Confederate Soldiers and in conjunction with this year’s Centennial Celebration of Metter and Candler County, The Dixie Guards Camp # 1942; Sons of Confederate Veterans are profiling notable local Confederates each week during the month. This week's profile is on Captain Daniel Leonard Kennedy of Metter. Dan Kennedy was born on January 21, 1836. In 1855, he left his home at the age of 19 to join the fighting in the Seminole War of Florida. Young Dan left from Bulloch County on his own horse and rode some 500 miles to enlist in the fighting at the Everglades. Kennedy fought in that conflict for two full years. When he returned home, the War for Southern Independence was brewing. He first enlisted in 1861 and went off to combat. Shortly afterwards, he felt compelled to bring more men into the fray from his home area, so he returned home and trained some 50 area men to form his own company. They followed Dan Kennedy into service and were attached to the 47th Georgia Infantry, Company G, known as the Tattnall Invincibles. Captain Phillip Tippins was the first commander of this company but later; Captain Dan Kennedy was chosen to lead the company. They fought as part of the Army of Tennessee and participated in battles at Chickamauga, Missionary Ridge, Kennesaw Mountain and the Atlanta Campaign. Later, the company was reorganized as Company H, First Georgia Regulars, commanded by Kennedy. The company surrendered to Union General William T. Sherman in Greensboro, North Carolina in April of 1865. Each soldier was issued $1.16 near the time of surrender and began their long walk home. After the war, Kennedy became a medical doctor. He soon earned a favorable reputation and was one of more prominent physicians in the area. He settled in the area now known as Metter and was one of the leading citizens in the new community. He and wife Abbicilla built their home and commissary near the area that is the present site of the Candler County Hospital. 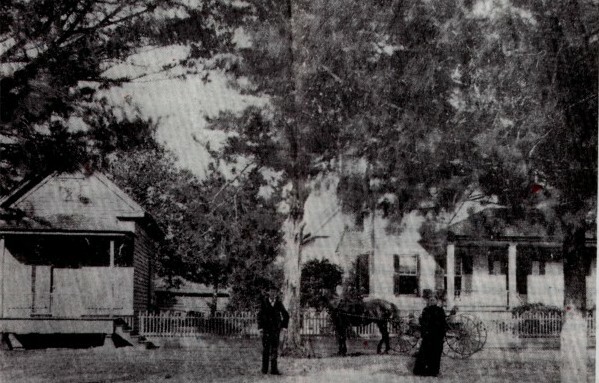 The picture taken below of the home and the family are dated at about 1870. At this time, Metter was still an unnamed rural crossroads on the Sunbury Road, but by the late 1880’s, enough people were living in the area that the United States Post Office agreed to provide local mail service. Before this time, the nearest post office was ten miles away in Excelsior. The U.S. Post Office required that any town receiving service must be named and policy required the submission of two names. Local history lore has it that Dr. Kennedy, as a leading founder of the community submitted two names to Washington for the postal service. According to earliest recollections, Kennedy’s wife Abbicilla suggested his own middle name, “Leonard” and “Meadow”. One story holds that a spelling error resulted in “Metter”, while another story holds that “Metter” was a derivative of “Met her” for his wife as the community was where he “met her”. Dr. Kennedy lived until 1905, long enough to see the creation of Candler County and the emergence of Metter as a thriving community. He was elected as Metter's first elected mayor. Kennedy Street is named in honor of his family. He is buried in Lake Church Cemetery.